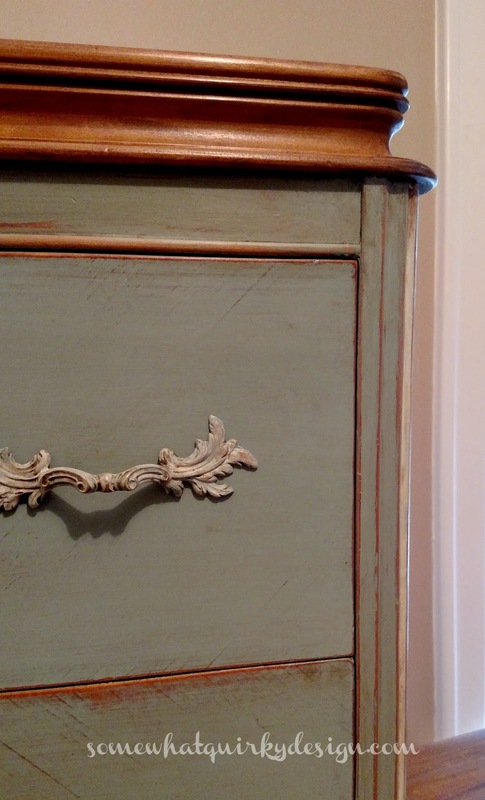 I am the last person on earth to use Duck Egg Chalk Paint®. And I've been missing out. Holy Moly have I been missing out! You see I'm not a blue person. 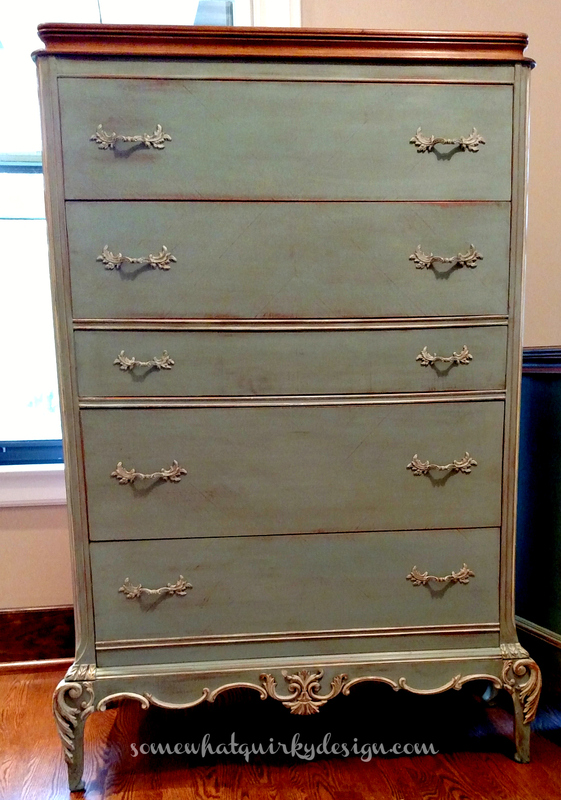 But when a client showed me a picture with the color palette she was hoping for, I knew that this was my chance. Duck Egg it would be. 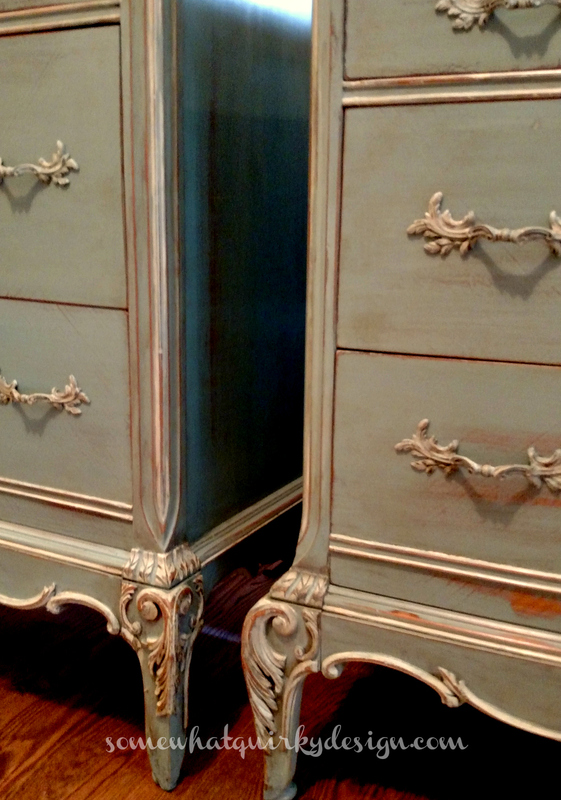 Two dressers with the most incredible bones. The fancy parts were pretty beat up. But that's ok. Because the client, she's a fan of the beat up. Fortunately she also wanted the wood tone top. And even more fortunately, the tops on these dressers - well they are magnificent. Can you believe those edges? So here's the scoop . . . 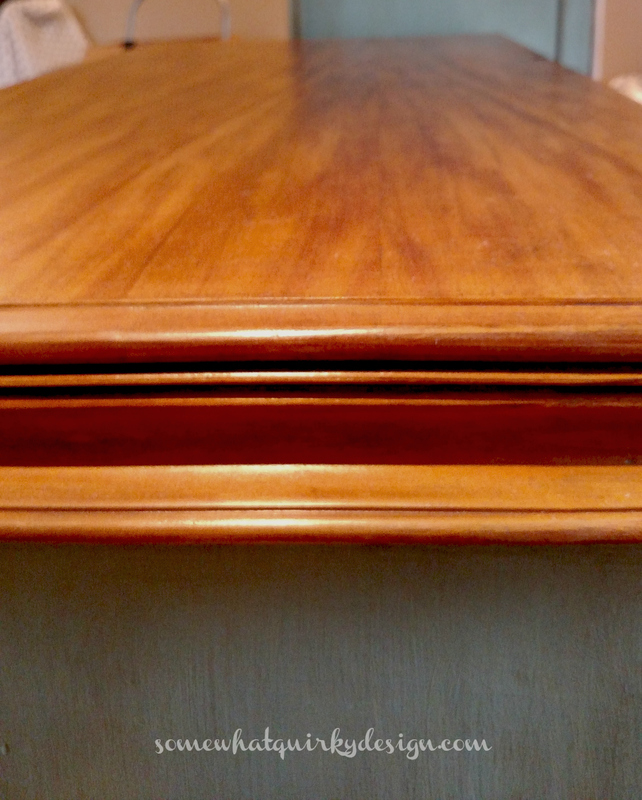 Tops were stripped with Jasco Premium Paint & Epoxy Remover. This is one of the chemically ones where you have to wear thick gloves and everything, but I find that it works best for shellac, lacquer, and varnish. I wanted something that worked quick and dirty on the curves. 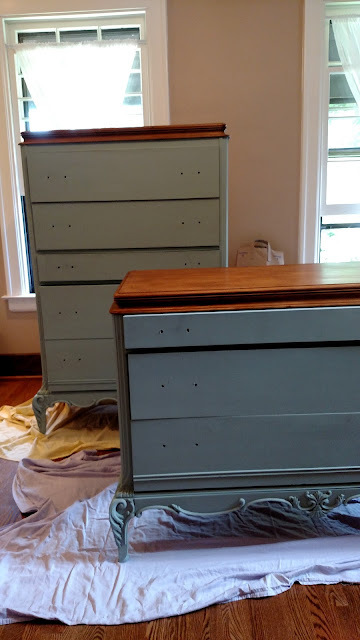 They were hand sanded and then I applied one coat of Dark Soft Wax by Annie Sloan. 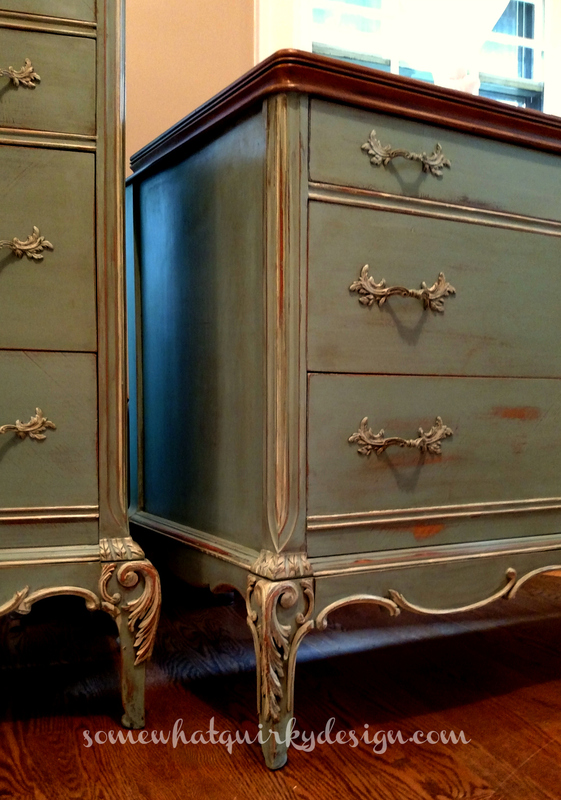 After 48 hours I applied one coat of Annie Sloan Clear Soft Wax. The dressers were then painted with 1 1/2 coats of Duck Egg Chalk Paint®. This picture actually presents one of the oddities of Duck Egg. It is a challenge to get the beautiful color accurately depicted in a photograph. Notice that the light causes the dressers to look like they are completely different colors? 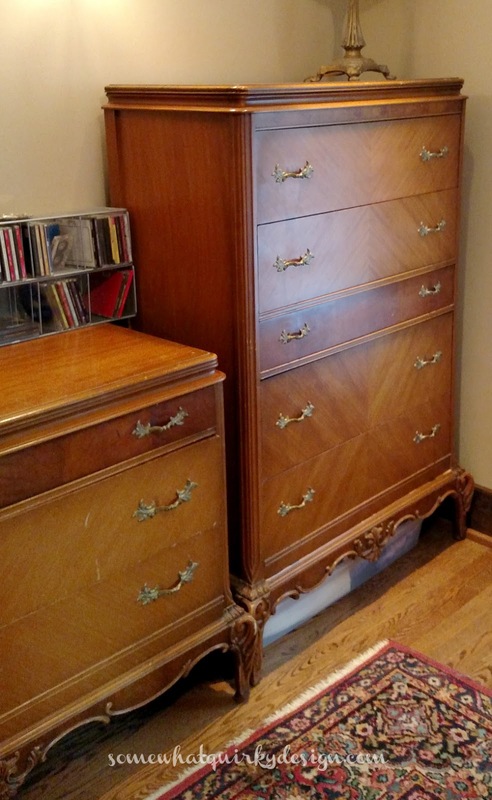 The back (tall) dresser is pretty color accurate. The front one - not at all accurate. We had this trouble when looking up images of Duck Egg. Apparently I'm not the only one who has trouble getting the green in the blue-green color to show up in pictures. Everything was then sanded smooth with 100 grit sand paper. 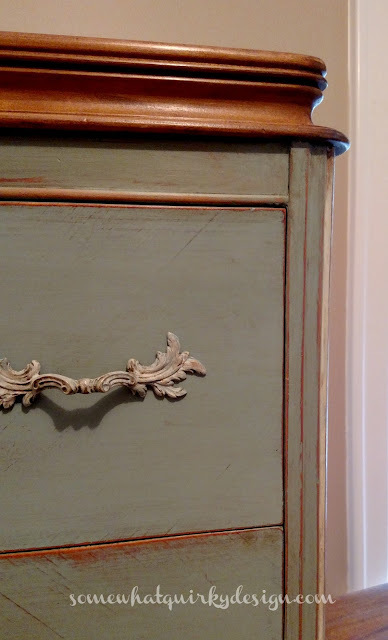 The client wanted pretty aggressive sanding but you have to be careful with pieces like these that have a fairly glossy surface. If too much shows through it looks a little fakey. The edges are usually dulled by use, but the flat areas are generally still pretty glossy. Everything was waxed with Annie Sloan Soft Wax. 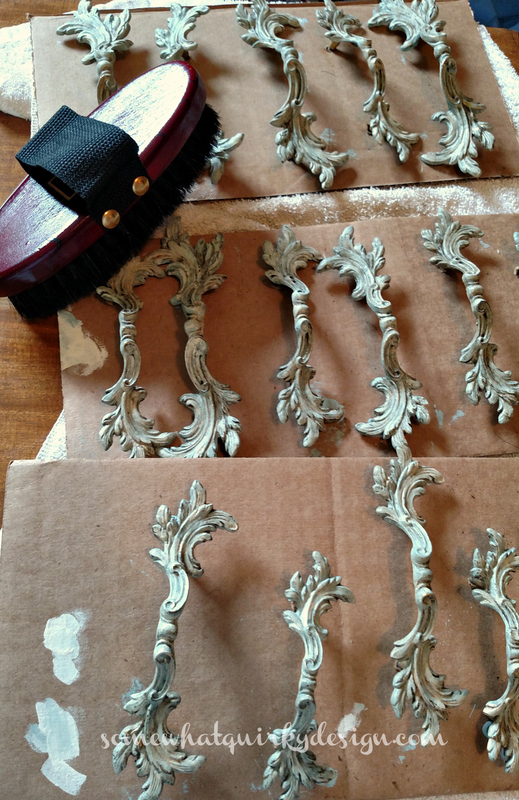 Then Dark Wax was used on all surfaces. Did I mention that the tops on these puppies are FANTASTIC? I wanted to keep the hardware because it was pretty great. It is painted with one coat of Duck Egg, dry brushed with Old White, waxed with Soft Wax, and waxed with Dark Wax - all by Annie Sloan. They are Be. U. Ti. Ful!!! So tell me . . .
Have you painted with Duck Egg? Love them, will pin from big computer tomorrow. And no....I'm a duck egg virgin. Unless you count real duck eggs. They look fabulous!! I haven't used Duck Egg, but I've seen it on pieces and it I'd gorgeous! Lucky client! You're so right, they are beautiful and work so much better painted, than just wood, even though as you say, they have great details. Not sure if I've used Duck Egg or not (I have no memory), but it's definitely a colour I'd go for - gorgeous. Great pieces! You did a fabulous job. I am going to follow you because I love to see good work. Really, really beautiful. Thanks also for the tip on the Jasco brand .. will have to remember that. Take care. 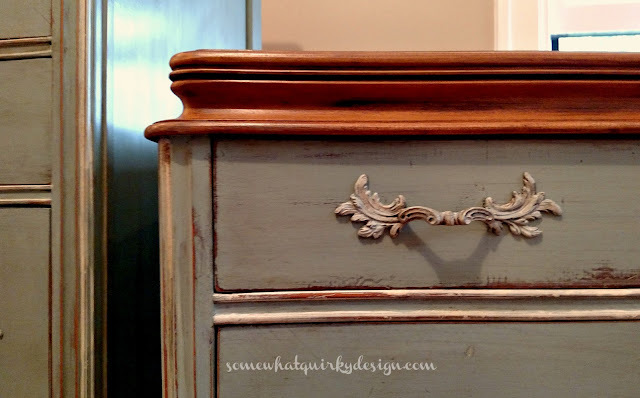 Wow...One of the best dresser makeovers I've ever seen! Love them!